In view of reducing the traffic at the airport check-in counters, SriLankan Airlines and John Keells Computer Services (JKCS) jointly launched “Evinta Hand Held Check-In” at the Bandaranaike International Airport (BIA). Evinta Hand Held Check-In is a landmark IT innovation introduced by John Keells Computer Services (JKCS) for SriLankan Airlines Ground Handling Services. The new technology allows SriLankan ground agents to come to the passengers, carry out the check-in process and print out boarding passes from a portable printer within a matter of a few minutes. Due to lengthy queues at check-in desks, SriLankan Ground Handling has long felt the need for more check-in options, though establishing more counters was not possible due to space constraints. Hence, the new solution not only saves the passengers’ time but also allows the ground agents to serve more diligently without feeling the need for more check-in desks. The new solution also minimizes delay costs, staff training costs and improves customer satisfaction. 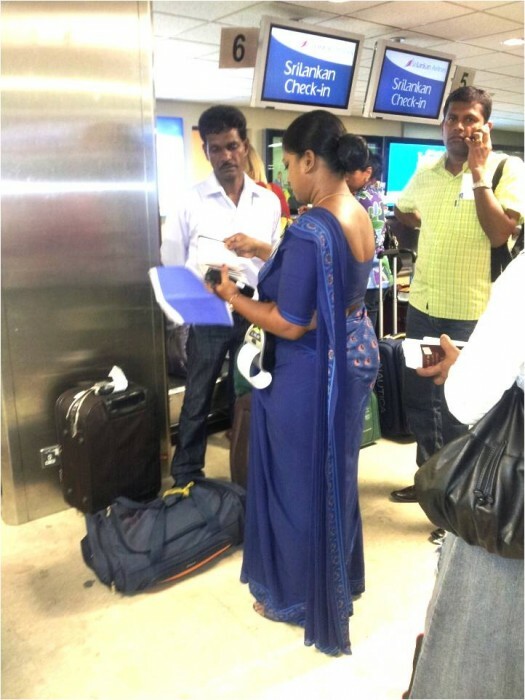 Since going live at the BIA on December 12, SriLankan Airlines Ground Handling agents have checked-in increasing numbers of passengers, from 51 passengers on day one to 86 on day three. The Evinta Hand Held Check-in solution brings many advantages to SriLankan Airlines Ground Handling, including fast turnaround times, minimized delay costs, minimized staff training and ultimately improved customer satisfaction. For a hub airport such as BIA, this is an ideal solution to increase check-in agents without increasing counters, thus reducing costs for SriLankan Ground Handling. Even the printing of boarding passes through the Hand Held Device is below 10% of the normal Boarding Pass printing costs. JKCS, the software subsidiary of John Keells Holdings, specializes in providing IT solutions to Airlines and Airports worldwide. The company’s Evinta product-line currently offers many Passenger Service Systems (PSS) and processes up to 15 million passengers per year. Evinta Hand-Held Check-In is the newest addition to this product category, and JKCS is proud to launch it as an alternative check-in solution for SriLankan. SriLankan Airlines Ground Handling is one of the leading Ground and Cargo Handlers in the region, with exclusive rights to be the sole ground handler at the Bandaranaike International Airport’s (BIA) and Mattala Rajapaksa International Airport’s (MRIA) terminals, providing services such as passenger handling, baggage services and cargo handling for over 31 customer airlines. The renowned ground handler has excelled in the past for facilitating and simplifying passenger travelling through the use of technology, and this newest addition to its customer service takes SriLankan Airlines Ground Handling to the next level. With the use of Cloud Computing, JKCS has incorporated many features into Evinta such as options to search for passengers, assigning seats, changing seats, printing boarding passes and even advanced options such as special service requests and identifying frequent travellers. All this is done with the use of just an internet connection, a Hand Held device and a mobile printer. This is made available in an intuitive GUI (Graphical User Interface) which requires minimum training for users. Up to now, JKCS has successfully trained over 40 Check-In staff to use the Evinta Check-In device. Having received many prestigious awards for its ground handling operations at the BIA, SriLankan Airlines Ground Handling is reaching greater heights in passenger service and airport operations using innovative technologies. JKCS is proud to be a part of this major step towards increased and improved passenger service levels in Sri Lanka.